School is back in session, and so is the Interim Fates series, with the second launch of this much anticipated three-book launch. If you’ve missed the news about this series so far, we launched Tiffany Tumbles, the first book in the Interim Fates series by the magical Kristine Grayson, in August. 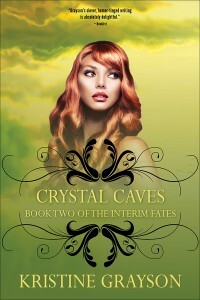 Tomorrow marks the official release day for the second book, Crystal Caves. And the third book, Brittany Bends—which will release mid-October, is available for preorder in ebook here. Crystal’s mother calls her “The Unexpected Consequence of a Momentary Lapse of Judgment.” Her half-brothers call her “The Unwelcome Visitor” because they didn’t even know she existed until a few months before. Her stepfather doesn’t even speak to her. Crystal’s beloved sisters, Tiffany and Brittany, decided to move in with their mothers after their father, Zeus, tried to use the girls to destroy true love. Crystal did what she always does—she did what her sisters wanted. Her sisters have loving mothers. Crystal doesn’t. Even though she lives in a beautiful Central Park penthouse and has a credit card with no limit, she misses her magic. More than that, she misses her sisters. She doesn’t fit in. And she can’t go home to Mount Olympus. She can’t even contact the Fates. Should she ask Zeus for help? Or should she gut it out in “the real world” with no love? She knows what her sisters want her to do. She knows what her parents want her to do. Now, for the first time in her life, she needs to figure out what she wants to do, regardless of the consequences. Although I’m labeling the Interim Fates Trilogy as young adult, like any great YA writing, these books will appeal to readers of any age. So, if you haven’t yet discovered the magic of Kristine Grayson’s books, what are you waiting for? Start with Tiffany, and then read Crystal’s story. You’ll be glad you did. Allyson Longueira is publisher of WMG Publishing. She is an award-winning writer, editor and designer.